Finland: Public and Community Health nursing in Savonlinna and outlying communities, community hospital and clinical, as well as interactions with Finnish Nursing Students that will occur prior (Skype) and during our visit. Day trip to Tallin, Estonia, and seeing the sites in Finland and TBA. Staying with in the historic 100 year old, Sinnetalo "The Blue House" with Finnish physician, Leena Kosmo; Ovalinna Castle, forest walks, cooking, Finnish traditions, swimming, sauna, opera dress-up, Ladies of the Castle Walk/Run, and cycling and rowing the countryside. TBA for other country. Approximately $4250 - 4500 including tuition) - includes ALL expenses: Air flight, trains, local transportation, hostels, admission fees, ferries, rentals, and all meals. This cultural learning adventure has students traveling between two very different countries who share a common border and interesting history. Finland has been ranked very high for healthcare in the European Union countries, especially in the public health arena; and St. Petersburg, Russia where they have unique challenges. There is a large focus on the political and social determinants of health with corresponding activities. There are scheduled activities for each day. You can expect that the schedule will change as we go through the day (much like life). Flexibility is absolutely essential. You have to be prepared to have your walking shoes on, prepared to work and have fun, and have your eyes and minds open to keep up on this high pace experience. Finland Clinical Experiences: Community hospital and clinic tours, Finnish nursing students and faculty at Mikkeli University of Applied Science interchange, and clinical days: Public Health Nurse, School nurse (elementary and high school), Home care nurse, community nurse, and rehabilitation home for alcohol and drug abuse. Russian Clinical Experiences: Students will start Skyping with a paired Russian nursing student as soon as confirmed for this site. Students will work with their international partner on a presentation at the Saint Petersburg Nursing School #1. We will tour the school, learn how to wrap babies, give basic nursing care Russian style, and interact with nursing students who are learning English. We have been working with The Harbor for the past three years. This NGO works with orphans who have been maxed out of the system. Teaching and interaction activities vary each year based on need. For the past two years we have been working with mothers and their children and plan to follow up with them this coming year. "The most meaningful cultural experience I had occurred when we worked with the orphan population of The Harbor. This was my most cultural experience because I felt like it was the time that I experienced "real" Russia. 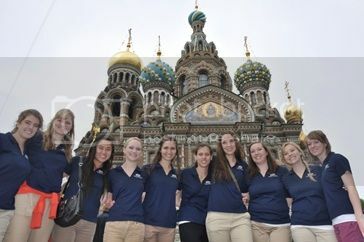 Up to this point we had interacted with the nursing students, toured the hospitals, and observed beautiful tourist sites; however, this experience opened my eyes to Russian culture the most. We visited amazing palaces full of ornate decorations and lavish grounds. These tours proved to be fun and beautiful, but it also provided a stark contrast to the environment we experienced that Sautrday morning. Upon our arrival to the building, I noticed that graffiti covered the walls of the buildings, and rap music blared from a boom box that was surrounded by shady looking boys. Upon entrance to the building, we found that it was tight for space and somewhat dirty. I recall someone in the group whispering, "So this is the real Russia." I know that we were all thinking it. I remember thinking that you can only experience so much of a culture as a tourist. Discovering the whole culture of a people requires getting to know the ordinary people in an ordinary setting and The Harbor provided us with that opportunity. "Furthermore, interaction with the orphans and their children proved to be a cultural experience. It was apparent that their lives are very different from my own. The mothers appeared to be stressed and overwhelmed, and some of the children appeared to be malnourished. Also, there was a language barrier. As I conducted the assessments on the children, I was reminded of how hard it is to use an interpreter. With each child, however, I improved my communication skills and found ways to make the child more at ease. "These observations and experiences opened my eyes to a people who have a lower socio-economic status and a lower level of education. At first, I felt uncomfortable because I was in a different place with a kind of people who I haven't had much interaction with. However, I found that it didn't take much time for both me and the children to warm up to each other. These experiences will help me provide more culturally competent care in my future nursing practice. I will no doubt treat people of different ethnicities, lower socioeconomic status, and lower education levels in my future practice. My communication and interaction with them will be improved because I know that all it takes is some effort to get to know a person and to listen to their stories and their concerns. Our day spent at The Harbor was fun and enjoyable. I came away with an appreciation for how blessed I am and an attitude of gratefulness to have experienced their culture. Even though I could not speak their language, I learned from the Russian orphans. Perhaps the most important lesson that I learned and will prove useful in my future practice is the fact that we are both human beings who really aren't that different."